This recipe was originally published in the Fall as my first post for the Columbia Culinary Society. I’ve had to put that series on hiatus because life is a bit crazy right now but I want to re-share what started it all! I have a love affair with fresh homemade pastas. Funnily enough, my mom and dad also made homemade pasta in college so maybe it’s genetic? Either way, the look on peoples faces when they realize “having pasta” first means that the pasta must be made is priceless. Break out the pasta roller or just use your fingers and get to pasta making! Make the pasta dough about 30 min. before you plan on cooking so that the gluten can relax. Sauté garlic in 1 tbsp olive oil. Put garlic with oil, squash, goat cheese, and an additional 1 tbsp in a bowl. Mix using a spatula or wooden spoon until combined. Salt and pepper to taste. Set aside. Roll out pasta dough using your machine or by hand (see “alternative method” section for directions). If using a machine, start at setting #1 and progress one at a time until you have reached #5. Assemble ravioli, dust with flour/corn meal, and set on sheet pan. Bring water to a boil. Salt water and cook ravioli for about 4 minutes or until they float to the top. While ravioli are cooking melt butter in a small pan and cook until it becomes golden brown in color. Add sage leaves and lemon juice and turn off heat. 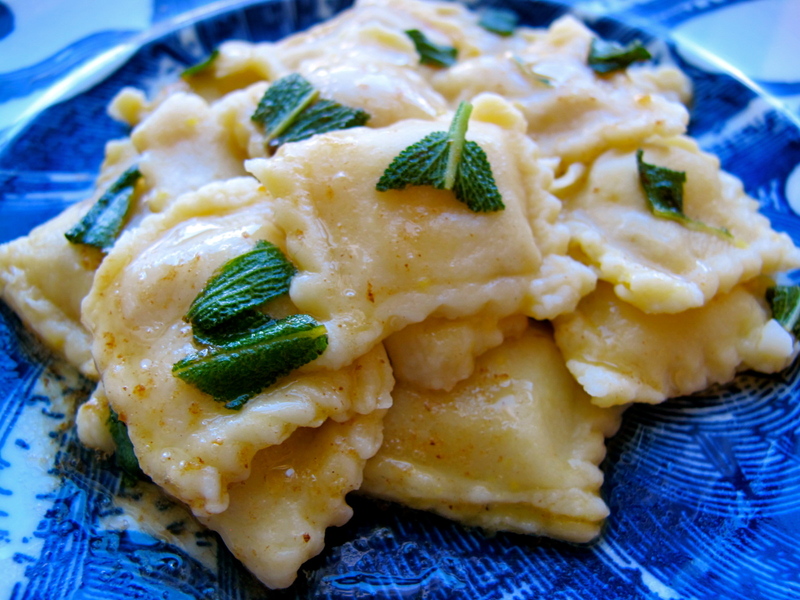 Pour butter sauce over ravioli. Serve immediately. Alternative method: Pasta can be rolled out by hand on a floured counter top as thin as possible without tearing. Paint with one egg yolk as ‘glue’. Cut into squares and place 1/2 tbsp of filling in the center of one half of the squares. Top with the remaining squares. Press out air bubbles and seal all of the edges with the tines of a fork, dust with flour or cornmeal, lay out on sheet pan and continue with the recipe as above.